Before I switched to freelancing full-time, I worked the night shift at a BPO in QC. I envied friends working regular hours and enjoying the “normal” life. After taking the leap of faith to work from home as a freelance copywriter, I realized it was one of the best decisions I made in years. Months into this newfound career path, however, a new “problem” surfaced in my mind. Working freelance is awesome—as long as you have a steady stream of projects from clients. This presents some degree of inconsistency since it’s not a fixed thing like getting a paycheck. And being a family man, it’s a constant source of worry whenever the thought comes to mind. I no longer envy those working with regular hours, I love my current set up. I love the flexibility it allows and the degree of freedom it provides. 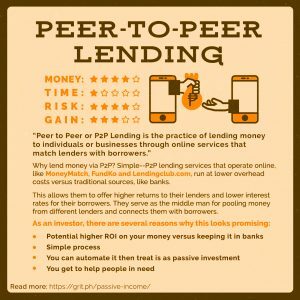 One thing I’d love to have, however, is some kind of passive income stream that will act as a safety net should the unfortunate client-drought happen. 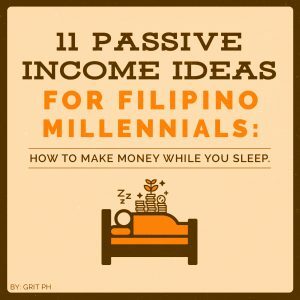 So after researching a ton of sources and reading a great deal of material, our team at Grit.PH came up with this extensive list of Passive Income Ideas so that freelancers like you and me can earn money while we sleep. 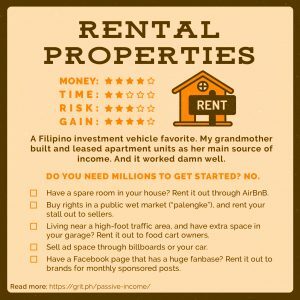 Renting out stuff or space is a great way to earn from property you already own. 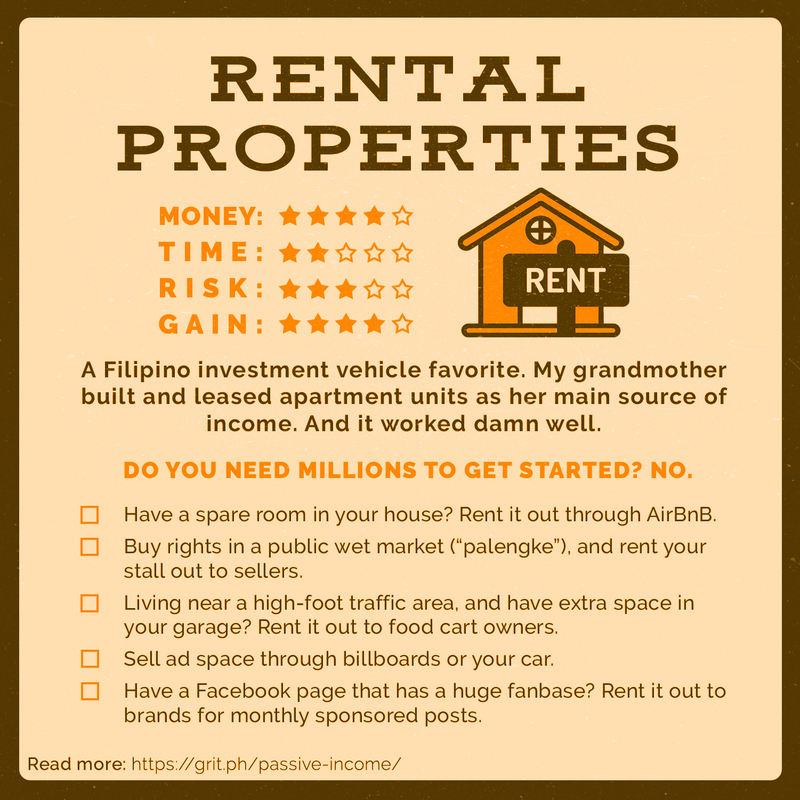 If you don’t have the resources, you can buy them out right instead and put it up for rent for passive earnings. 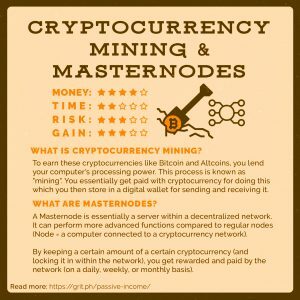 Bitcoin and a handful of other cryptocurrencies (alt coins) still remain very promising today. 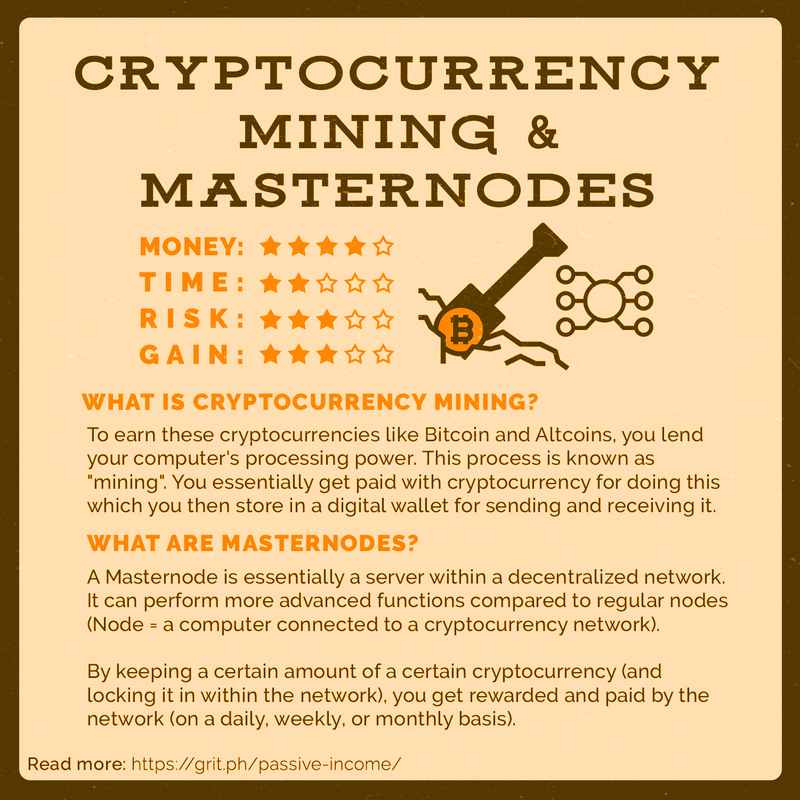 They’re still riding the waves in terms of returns right now, with a single unit of Bitcoin going for several thousand thousand dollars. 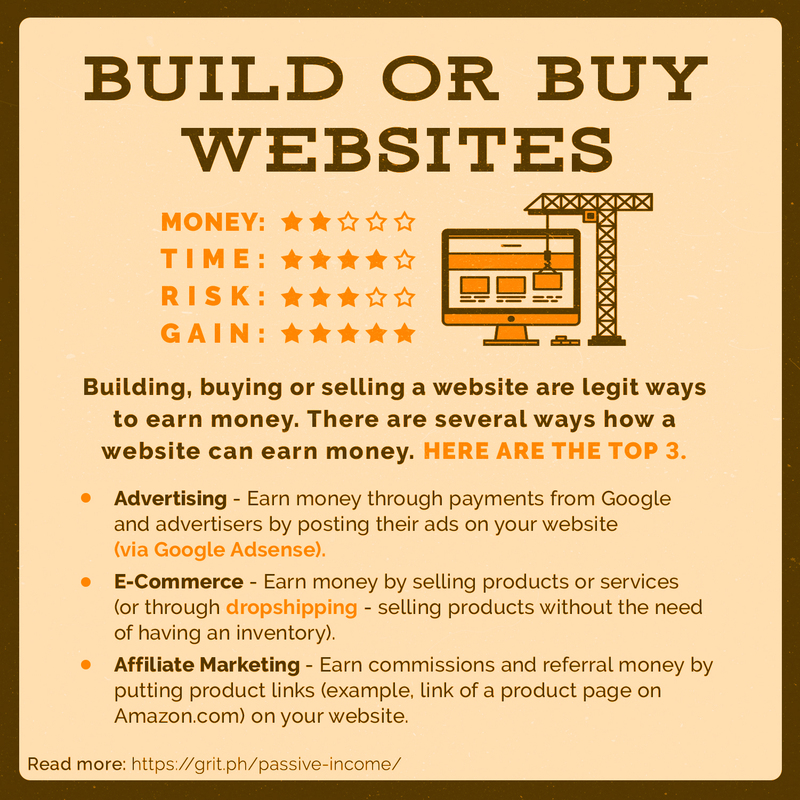 There’s a plethora of ways for a website to earn passive income. 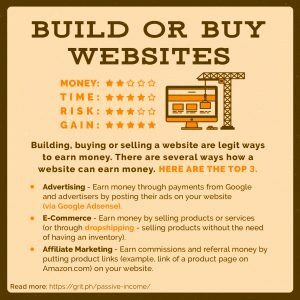 You can learn the ropes and build one yourself or buy an existing one that’s already raking in some earnings. 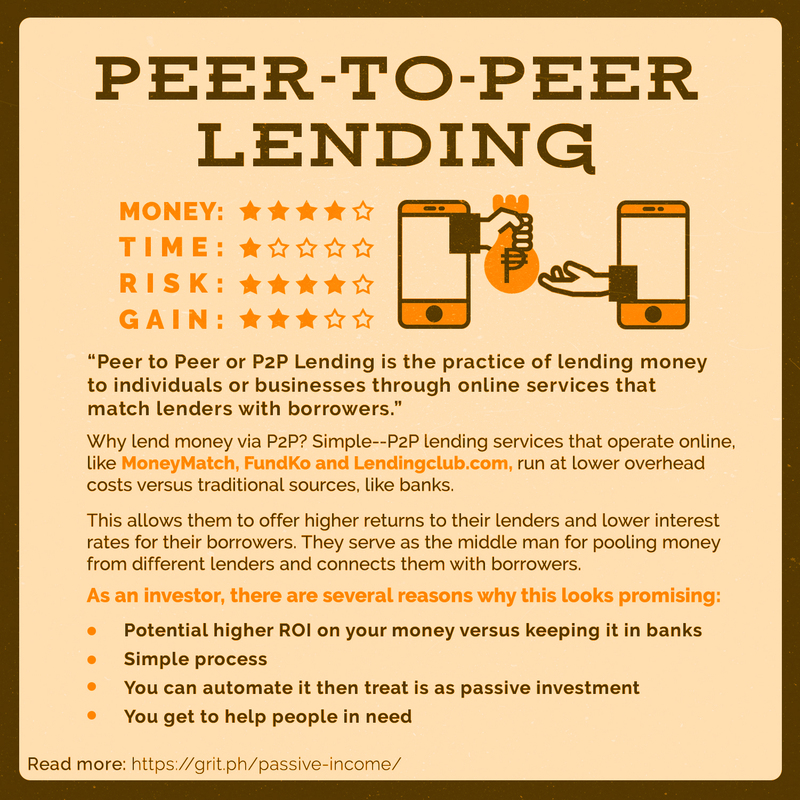 Lend money to earn money. 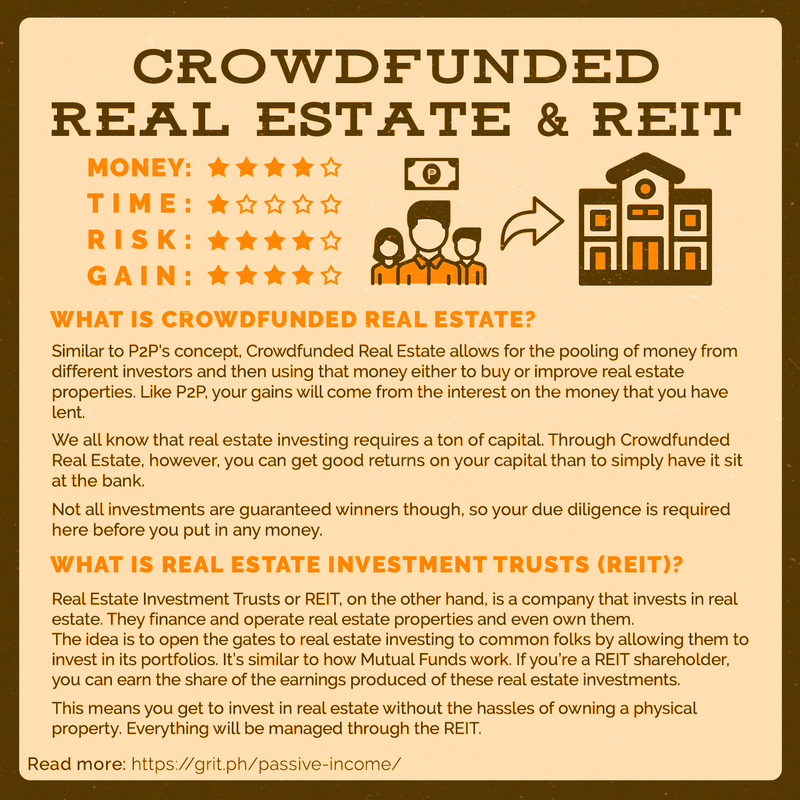 Your capital will be pooled with funds from other lenders and you will all earn from its interest. 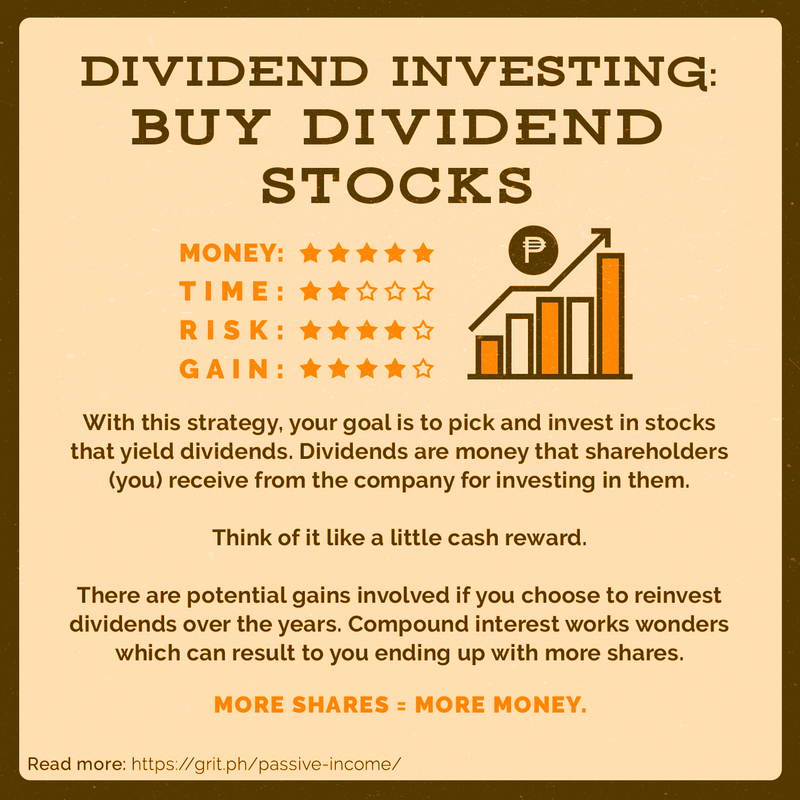 Some investors think that owning stocks truly payoff if you play the long game. But sometimes, it pays more sooner than expected. 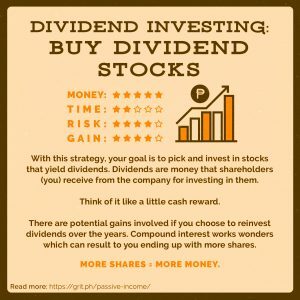 Companies reward stockholders during periods of good stock performance through dividend Investing. 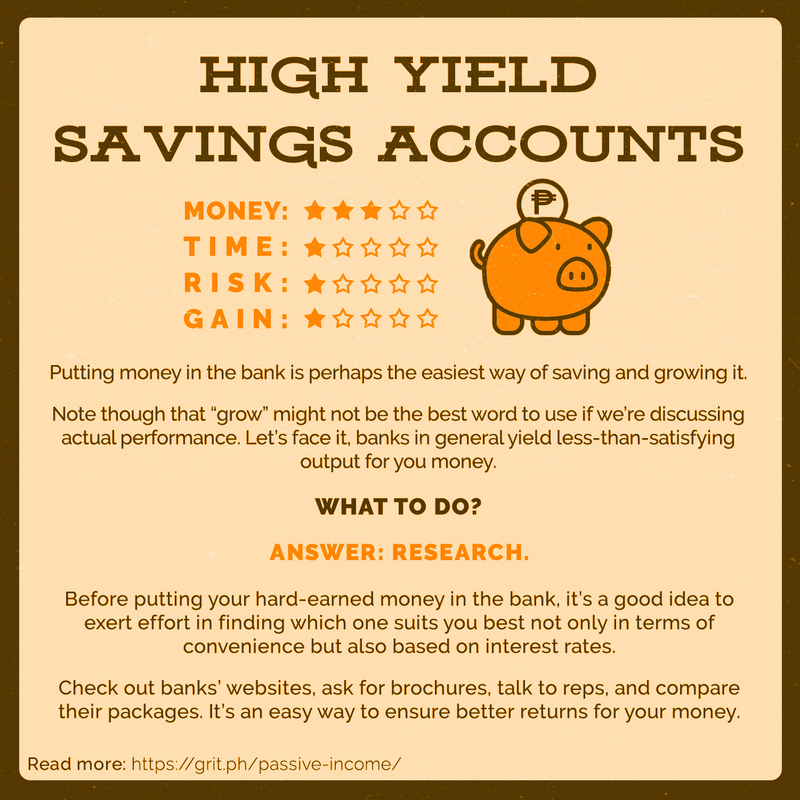 There are plenty of bank products that offer better returns than your typical savings account. 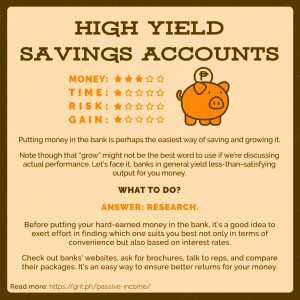 Products like UITF and other high-yield savings accounts offer significantly better gains for your money so make sure to ask around and research before plopping down your hard earned cash to invest. 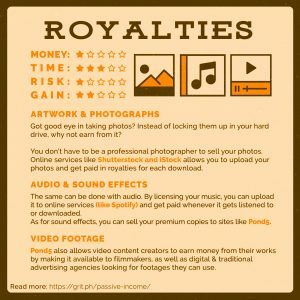 If you’re a creator who makes videos, music, artwork, and other forms of media content, you can earn from them through royalties. 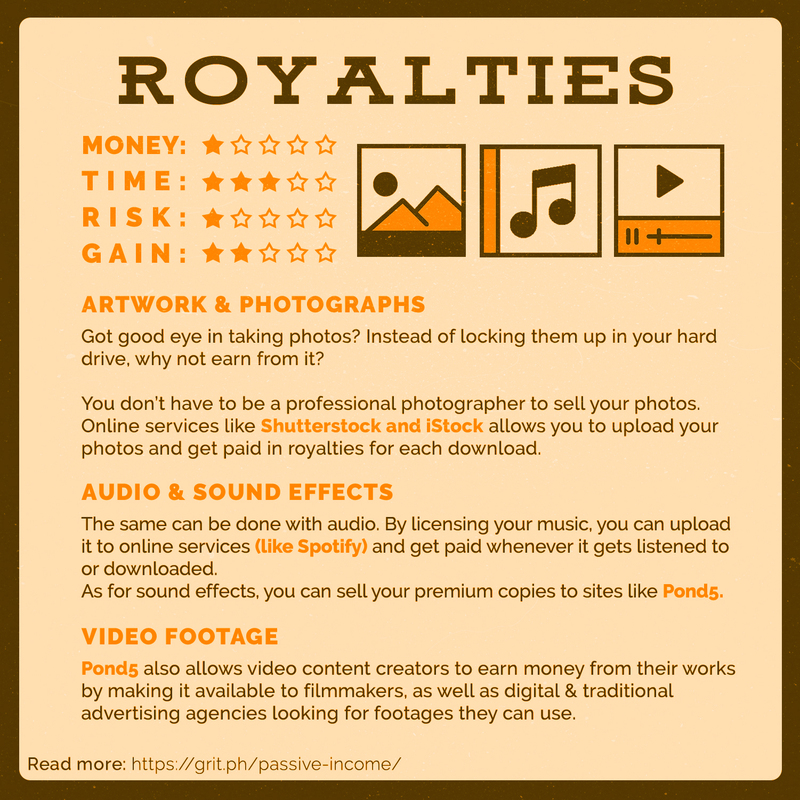 Think of it as someone paying you in exchange for using your content. 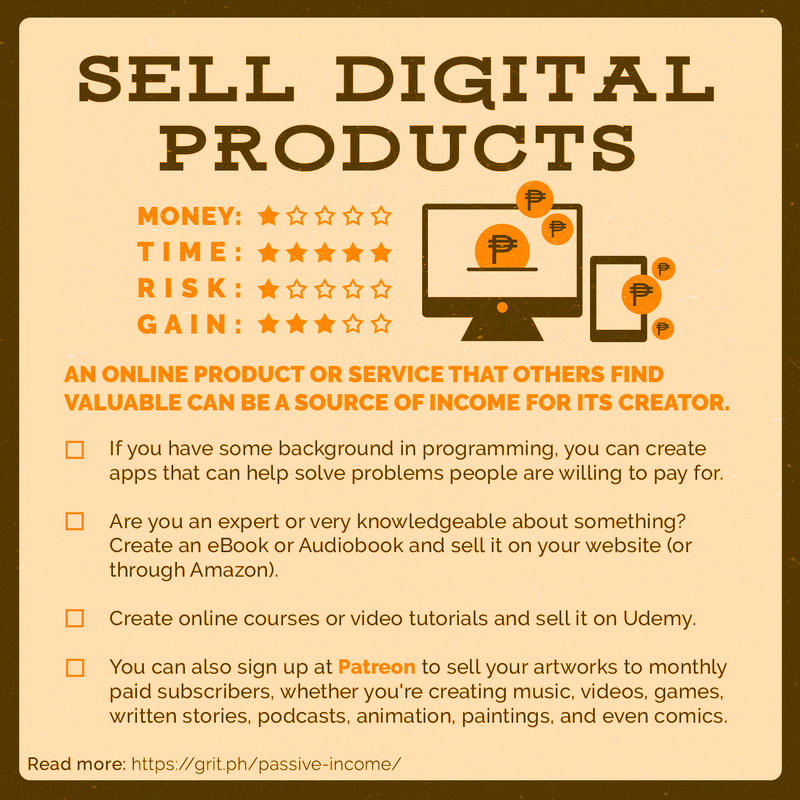 These can range from eBooks to digital courses, mobile and web apps to Google Chrome extensions. 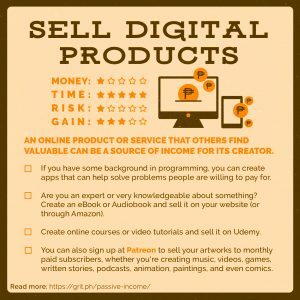 There’s literally hundreds of ideas in this category so if you have the skills, better cash in on them by selling your product. 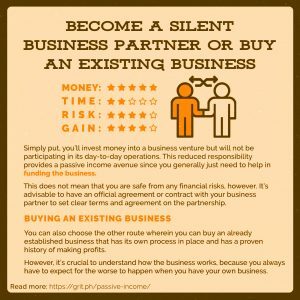 Your main job is to be finance a portion or a specific share for running the business. Your partner(s) will be doing the work of managing and running day to day operations. Think of businesses that require minimal daily hands-on management like charging stations and slot-operated drink dispensers. 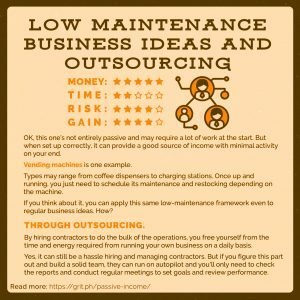 Or you can run a business or get client and contract deals and then outsource the bulk of the work to contractors. 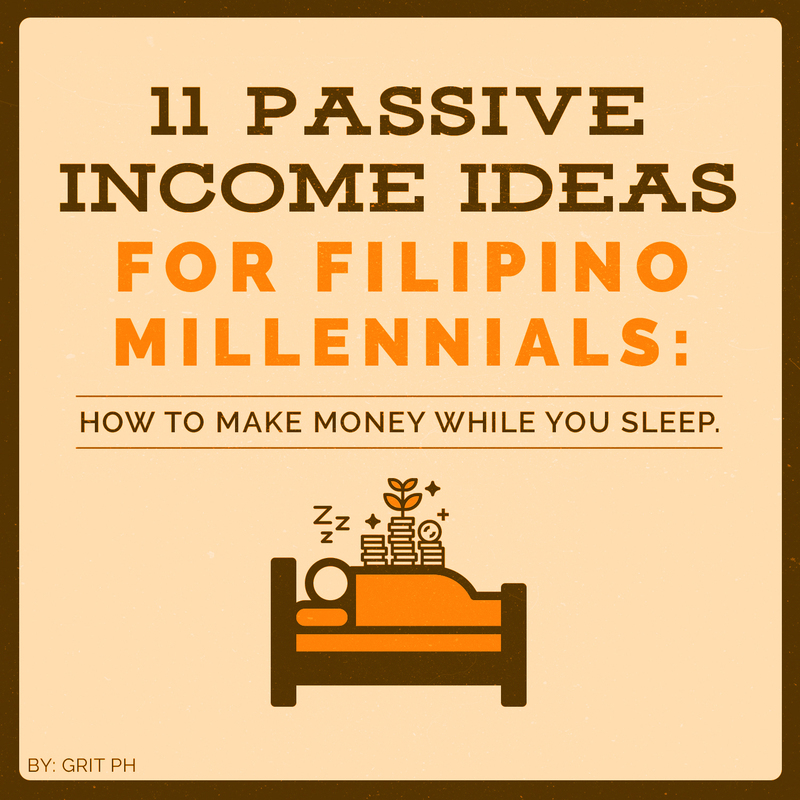 Passive income is essential to building wealth. 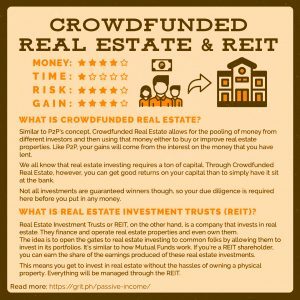 It’s like having a clone who works and earns money for you while you take care of other stuff. 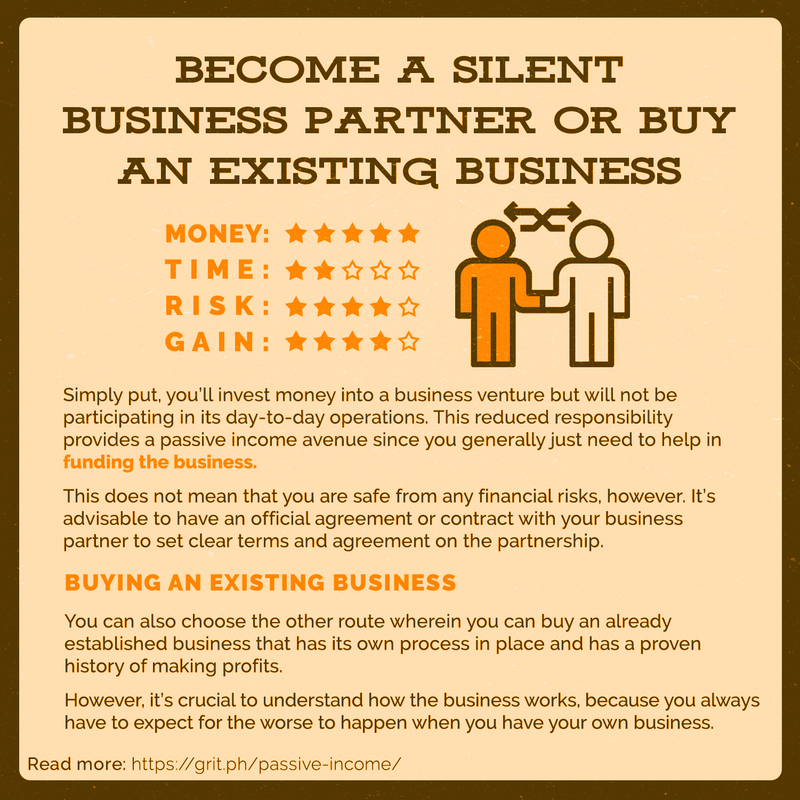 Passive income allows you to setup a replicable business model that enables you to reinvest your earnings and multiply your income generating streams. Start with a little change in perspective that money does not always need to come in the form of paychecks. 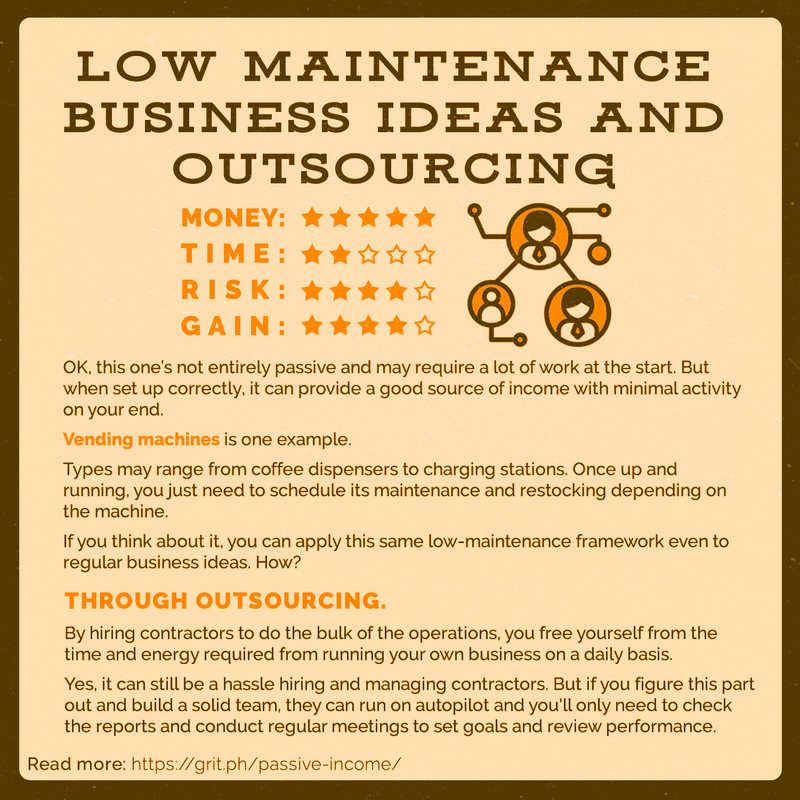 Amiel Pineda is the lead business/finance columnist of Grit, where he authored this data-driven guide to the top online jobs in the Philippines. He’s also the editor-at-large of ThreeBest.